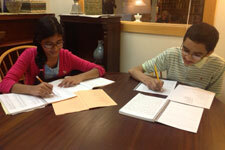 We welcome students from grade school through college, tutoring them one-on-one or in small groups. Our tutors strive to enhance each student’s natural curiosity, imagination, and independent thinking by putting the student at the center of his or her educational experience. Each program is self-paced and takes into account the student’s learning style, aptitude, and potential. After an initial evaluation, the student contracts with his or her tutor to work together to achieve the student’s goals within an agreed-upon time frame. Sessions are normally scheduled in 6-week or 12-week renewable blocks during the academic year, or as intensive summer tutorials. One hour to one and a half hour sessions from $50 to $85 per session, depending on the subject, the duration of the lesson, and the number of sessions for which a student enrolls.